Calculates the form factor, P(q), for a monodisperse spherical particle with uniform scattering length density. The form factor is normalized by the particle volume as described below. 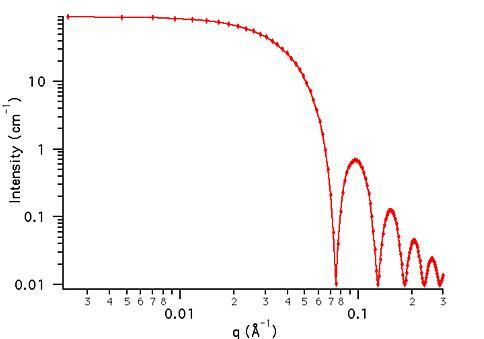 If the scale factor Parameter is set equal to the particle volume fraction, phi, then the returned value is the scattered intensity per unit volume, I(q) = phi*P(q). However, no interparticle interference effects are included in this calculation. This example dataset is produced by calculating the Sphere using 128 data points, qmin = 0.001 Å-1, qmax = 0.3 (Å-1) and the above default parameter values.